White Crape Myrtle knew as Lagerstroemia. White Crepe Myrtle has several trunks rather than one with smooth bark. The multiple logs give the White Crepe Myrtle the ability to withstand all types of weather including strong winds. White Crepe Myrtle is fast growing with attractive leaves. The White Crepe Myrtle leaves are a deep green wide in the middle with pointed tips that turn an orange and red in the fall. The flowers on this shrub are white with a soft texture and shaped in clusters of small blooms at the end of the limbs. The flowers bloom through the spring and summer and if the dead flowers are taken off the plant may flower more. 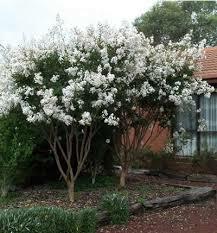 White Crape Myrtle grows in most types of well-draining soil and will thrive in full sun or partial sunlight. The tree can tolerate drought conditions without adversity. These shrubs are favorite in landscaping because of their beauty, and they are easy to grow with little maintenance. They do not need to prune the bush though they do often have small shoots at the bottom of the trunk that can be pruned. The soil should be considered before planting this tree to ensure it drains well for healthy roots. The shrubs attract bees, butterflies, and birds. 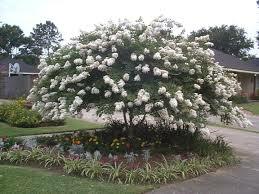 The white crepe myrtle tree can be a focal point in many landscapes. White Crape Myrtle matures to be about 25 feet tall and about 17 feet wide has beautiful white flowers from late spring until late summer. Then, when temperatures begin to drop, its leaves turn a brilliant orange. The flowers are incredibly dense on this hardy tree. Therefore, they can be used as a privacy screen if desired. 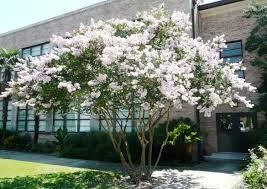 White crepe myrtle trees prefer full sun and well-drained soil, however, it tolerates mild droughts. They can be multi-trunk or single.